GERMANY: Carbon cuts pledged in Paris two years ago are just a start and countries need to step up action urgently, German chancellor Angela Merkel told UN climate talks in Bonn. 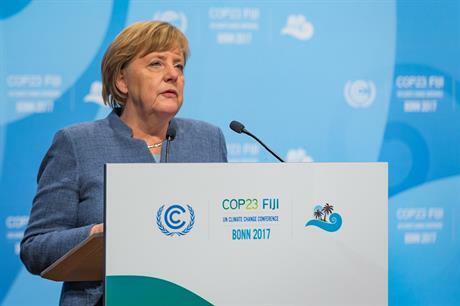 In a keynote address to COP23, where 190 countries have gathered to discuss implementation of the 2015 Paris Agreement, Merkel said more steps were needed to combat climate change. The EU and other major emitters agreed in Paris that their pledges on carbon cuts – derided as woefully inadequate by climate scientists – could be ratcheted higher after 2020 to help meet temperature goals of 2C and 1.5C. The Bonn talks are mainly about agreeing rules on how pledges and deeper cuts can be implemented, with COP24 in Katowice, Poland, next year earmarked as a deadline for guidelines to be agreed. "We have to stand together by implementing it [the Paris Agreement]. It is important to build trust and build reliability," Merkel told delegates, pointing to Germany's willingness to double its current contribution to climate finance. French President Emmanuel Macron, who addressed the plenary immediately after Merkel, was more strident in his comments on coal, pointing to the country's proposal to close all coal-fired power by 2021 and a ban on exploiting hydrocarbons on French territory. Macron told the Bonn talks that reforms agreed last week to the EU's emissions trading scheme could provide a carbon price of €30, adding that this should be backed up through tariffs on countries that failed to put a price on carbon. Macron concluded his speech in dramatic fashion: "Rich countries today do not have the choice of imposing their own tragedy on the rest of the world. We only have one horizon of planning — that is now." The Bonn talks are being held close to one of Germany's biggest sources of brown coal, or lignite, which fuels huge power stations. Many of these were built in the last decade, and green groups and analysts say these plants will need to be closed well before the end of their 30-year operating life to enable Germany to meet its aim of being carbon neutral by 2050. Deep cuts in Germany are also viewed as crucial to the EU's ability to scale up its carbon cuts in the coming decades. Merkel's comments come as her CDU party tries to cobble together a coalition agreement with the Greens and pro-business Free Democrats, following last month's general election. There is disagreement on the extent to which Germany should reduce its reliance on coal, which currently accounts for 40% of the country's power generation mix. Merkel said there will be "hard discussions" on coal in the coalition talks but pointed out that climate policy also needed to take account of social and economic aspects, such as jobs.